A Peace Corps For Doctors, Built By A Senator's Daughter : Shots - Health News Vanessa Kerry, a daughter of Sen. John Kerry, has created a nonprofit to partner with the Peace Corps in sending doctors and nurses abroad. In return, the organization pays off a portion of the volunteers' school loans. The goal is to reduce the severe shortage of medical workers in developing countries. Dr. Vanessa Kerry talks with her father, Sen. John Kerry, before he delivers a speech on health care in Boston. Fifty years ago President Kennedy started the Peace Corps with the promise that it would train doctors in faraway lands. But, you may be surprised to know, the Peace Corps has never actually recruited doctors and nurses as mentors and medical educators. Dr. Vanessa Kerry wants to fulfill that promise. The 35-year-old physician — a daughter of Sen. John Kerry — has created a partnership with the Peace Corps to send doctors and nurses abroad. In return a non-profit pays off part of school loans. "It's a Peace Corps for doctors and nurses," Kerry tells Shots. The goal of the Global Health Service Partnership, as it is tentatively called, is to reduce the severe shortage of medical workers in developing countries. But she thinks the partnership will also strengthen health care here stateside by infusing U.S. doctors with a worldview centered on making the most of available resources. That's not exactly the prevailing philosophy of medicine as it's practiced stateside. "There's evidence people come back with better clinical skills, better appreciation of needs, more likely to work in underserved specialties," she says. Kerry, who directs a global health program at Harvard Medical School and works at Massachusetts General Hospital's Center for Global Health, knows something about the trials and satisfactions of practicing medicine in severely underresourced places. "I've lived with a cold-bucket shower for many a week, and you're fine with it if you're committed to the work," she says. And small investments can make a big difference. In Uganda, for instance, a major cause of death is brain hemorrhage following auto and motorcycle accidents. The Center for Global Health helped to get the medical supply company Stryker to donate an electric craniotomy drill. "With an electric drill you can (evacuate blood) in two minutes," Kerry explains. "We've used this drill a number of times, and it's saving lives. I got a letter saying 'You don't know what a difference this has made.' "
Partnering with the Peace Corps is a strategic move — not only for name recognition — but to tap into its half-century of experience. "The Peace Corps doesn't have the technical capacity to do clinical medicine and nursing," Kerry says. "But they do well at deploying people in a sensitive, integrated way." To fill the medical gap, Kerry wrote commentaries in The New York Times and the The New England Journal of Medicine. After persuading the Peace Corps to get on board, she worked with them to got money from the federal government (through PEPFAR, a $15 billion program to fight HIV/AIDS) to help pay for the health corps. The Global Health Service Partnership launched in March, and it started taking applications in August. It plans to have 36 health workers in Tanzania, Malawi and Uganda by next July. What distinguishes this program from other travel fellowships is that it will pay off school loans, about $30,000 for each year of service. Kerry says this should open up the program to more doctors. "What is really important is that you cover your interest at minimum. 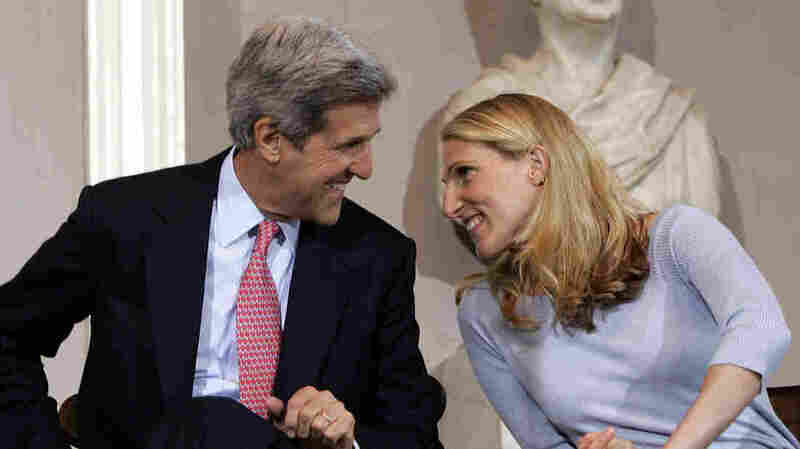 $30,000 a year is more than enough," Kerry says. The Global Health Service Partnership volunteers won't just provide on-the-spot medical care. Kerry says they'll be teachers and mentors to local doctors, augmenting faculties of medicine and nursing. "We've been very clear that these people are there to provide faculty support and integrate with faculty in these institutions," Kerry says. This way, they can grow local health systems in a sustainable way. She thinks that might eventually help reverse the medical brain drain that plagues many developing countries. "If we can build up opportunities and create a better academic environment, that can build up retention [of local doctors]," she says. Health professionals often migrate not just because they can make more elsewhere but because they can't practice the kind of medicine they want to at home, she says. By raising the standard, they might stay. "People want to stay in their country, they want to stay with their family," Kerry says. The opportunities just have to be built.